Irish Ferries has hit back at notices issued by the National Transport Authority surrounding the cancellations caused by the delayed debut of the WB Yeats ferry. The ferry company “expressed its disappointment” with the orders for compensation to passengers, saying the cancellations experienced by passengers were due to “extraordinary circumstances”. The €147m ferry, which had been due for delivery on July 30, to enter service with an inaugural crossing from Dublin Cherbourg, suffered delays at its Flensburger Schiffbau-Gesellschaft shipyard in Germany. The ship’s entire summer season had to be cancelled, and it finally arrived into Dublin on December 20 last. Irish Ferries later responded, arguing: “These cancellations were due to extraordinary circumstances which were completely outside of the company’s control. 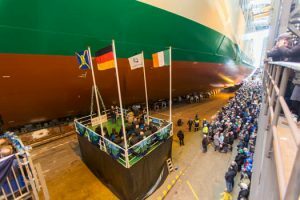 Since the delay was due to unforeseen delays by the shipbuilder FSG, and was notified to passengers months ahead of planned sailings, Irish Ferries does not agree that the company infringed the relevant EU Regulation. “In dealing with its customers Irish Ferries believes it took every reasonable action to provide passengers with alternative travel options, from a no-quibble immediate refund to allow them to make alternative travel plans, as well as alternative sailings on the Oscar Wilde out of Rosslare Europort and Landbridge alternatives” via Britain. The NTA said its board came to the view by October 19, 2018 that the ferry company “failed or is failing to comply with and has infringed or is infringing Article 18 and Article 19 of the Maritime Regulation”. It also authorised the serving of two notices on Irish Ferries. Article 18 relates to what cancelled or delayed passengers are offered, either rerouting to the final destination, under comparable conditions, at the earliest opportunity and at no extra cost, or money back instead. Article 19 covers the payment of compensation if requested by passengers in the event of delay in arrival at the final destination as set out in the transport contract. Compensation is 25pc or 50pc of the ticket price depending on the scheduled duration of the journey and extent of delay experienced. The two notices served on Irish Ferries required it to pay compensation to passengers who have already requested it, and reimburse additional costs for those passengers who had to travel on sailings to and from Rosslare, rather than Dublin, and to and from Roscoff, instead of Cherbourg. Irish Ferries made representations to the Authority, and they were reviewed and discussed by the board of the Authority – but on January 25 last the board decided to uphold the notices, and are giving Irish Ferries two months to comply. It said that “the NTA’s approach to the regulation has contributed to making the route commercially unviable into the future”. It claimed that it has “on numerous occasions, attempted to engage with the NTA by offering to enter into a mediation process without any preconditions. The NTA have not taken up this offer. Irish Ferries will appeal the NTA’s decision in the courts (including, if needed, the European Court of Justice).